This FJ43 is headed to the big city beach town of Miami, Florida, home of art deco-styled drives, high-rise condos and blue water causeways. Its open-air cabin and retro-cool vibes make this one hot beach town ride. 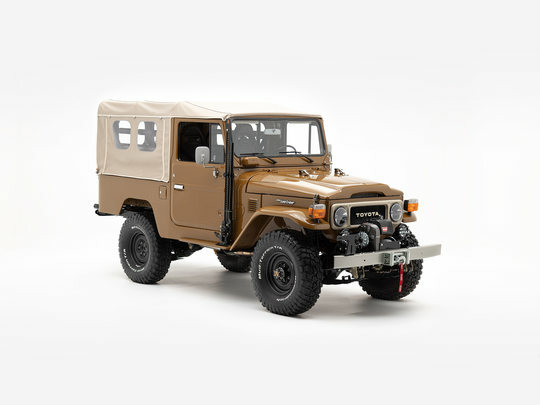 There’s just something about the FJ43 and its steel body with all of those exposed bolts and sharp edges. No, they definitely don’t make them like this anymore. But yet, here it is, the legend, back in its prime, with its iconic front grille adorned with the unmistakable Toyota emblem, rolling on 33” BFGoodrich Mud-Terrain tires, fully restored and painted in Olive (637), a shade that reminds us of endless stretches of shoreline. The classic Land Cruiser driving experience is more than a look, it’s a feeling. One that isn’t lost on this FJ43. Look under the hood, and you’ll find the fuel injected Toyota 1FZ, a 210-horsepower engine with that familiar sound. And of course, we made all of the serious upgrades that make this 4x4 safer and more comfortable to drive, features like a 5-speed manual transmission, Old Man Emu suspension, front disc brakes, and Advanced Power Steering. Luxury isn’t a word you’d associate with the rough-and-tumble Land Cruisers from decades ago. But yet, here it is, a cabin wrapped in leather with custom-stitched side panels and Corbeau MOAB seats. This is where beautiful materials and retro details combine to create a classic cabin that’s casual, comfortable, and equipped with all the amenities you’d want on a long journey: climate control, Bluetooth, and a digital audio system. With a 1GR-FE engine and modern upgrades, the G40 Expedition by The FJ Company is an amped up version of the classic beach ride. Customize yours!